Mike and Billy Swenson began operating Svante’s Stuffed Burger food truck in 2012 in order to bring delicious grass-fed beef direct from our family ranch to the Austin area. They named the truck after their great, great, great grandfather, Svante Magnus Swenson who in 1838 became the first Swedish immigrant in Texas. He played a prominent role in early Austin running one of the first stores here. He purchased the land where the SMS Ranch is still located and run by our family today near Stamford and Throckmorton, Texas. 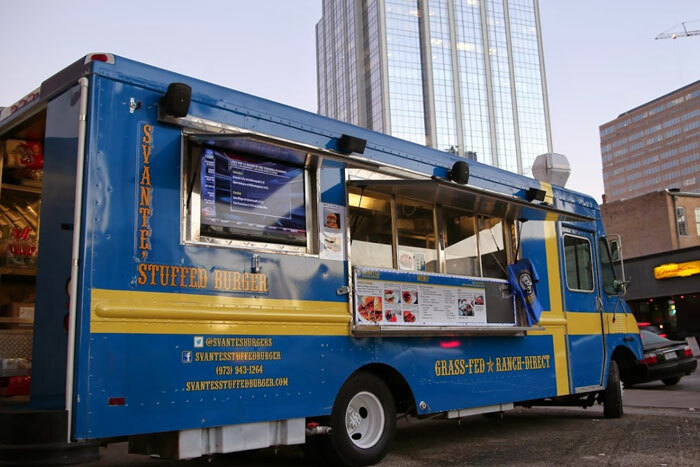 The truck features gourmet burgers made with our own grass fed, grass finished beef. Over the last five years, Svante’s burgers have been recognized as some of the best around, most recently having been named as the Best Burger in Austin for 2014 and 2015 and was recently named one top 20 burgers in the US by Thrilllist.com. The food truck is regularly rented out for special events such as SXSW and other local festivals, weekend brewery nights, wedding receptions, private parties and corporate lunches. Please contact us if you interested in having the truck cater your event. Round Rock Music on Main St.